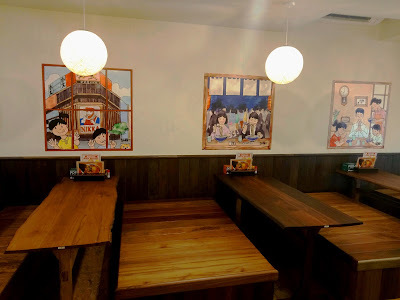 Special thanks to Menya Miyabi Hokkaido Ramen for extending this food review invitation. 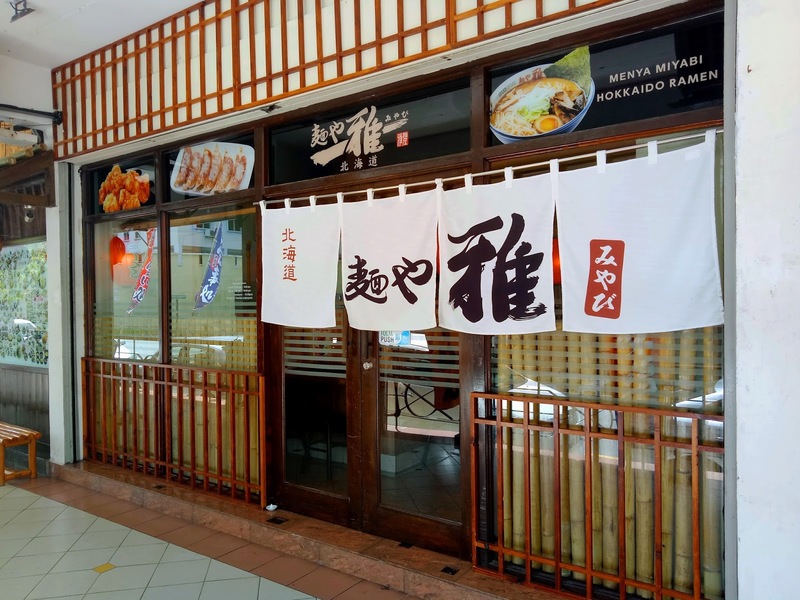 Prima Tanjung has a disproportionate number of Japanese eateries due to many expatriates living in the vicinity. One of these restaurants is Menya Miyabi Hokkaido Ramen (麺や雅), which is sandwiched between Aji Noren and K-Pot. Menya Miyabi was founded in Hokkaido (北海道) in 1998. 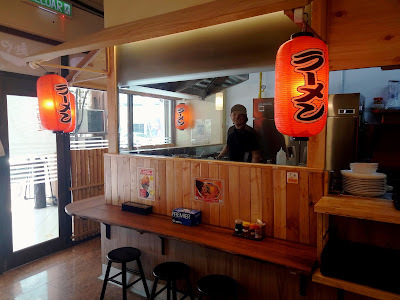 This chain of ramen shops is named after the founder's wife, Masako (雅子). There are currently 4 outlets in Hokkaido and 3 in Malaysia. Besides this Prima Tanjung outlet, the other Malaysian outlets are located in Queensbay Mall and Sunway Pyramid. 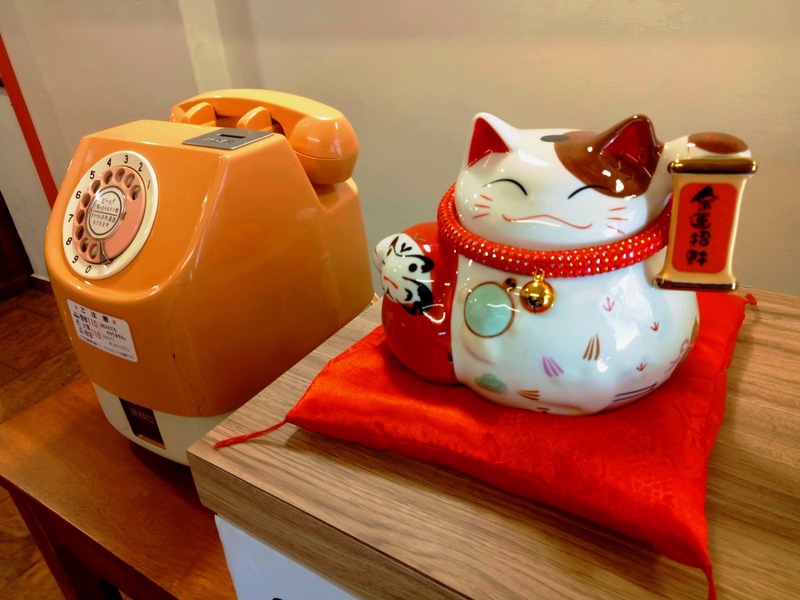 The Prima Tanjung outlet borrows elements from the Shōwa era (昭和時代). Yellow lamps illuminate the dining area with warm light, invoking a sense of nostalgia. On the walls are pictures that depict familiar sights in Hokkaido. Among them is the iconic Susukino Crossing (すすきの交差点) in Sapporo (札幌). Besides old-fashioned wooden tables, customers can also choose to be seated at the bar next to the kitchen. Menya Miyabi specializes in Hokkaido ramen (北海道ラーメン). 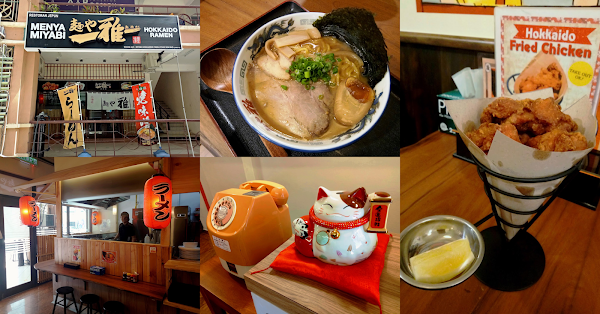 Even by Japanese standards, ramen from Hokkaido is renowned for its premium quality. 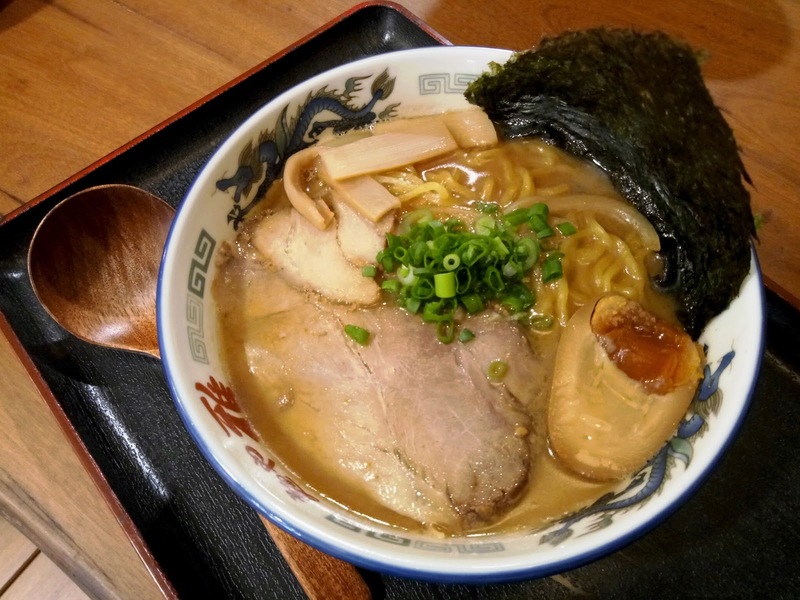 Hokkaido tends to use thicker ramen when compared to other prefectures. This results in a chewier and springier texture. A good bowl of ramen revolves around the tonkotsu (豚骨) broth. Boiled from collagen-rich pork bones more than 14 hours, the broth is saturated with savory flavors. To keep the taste as authentic as possible, Menya Miyabi sources most seasonings from the original shop in Japan. Menya Miyabi has 7 types of ramen that differ in terms of seasoning. For instance, the original Yaki-Miso Ramen (焼味噌ラーメン, RM25.00) is prepared from the restaurant's signature miso paste (味噌). Next, Tonkotsu Ramen (とんこつラーメン, RM25.00) is sweeter and is more aligned with the local palate. Tonkotsu Shoyu Ramen (とんこつしょうゆラーメン, RM24.00), only available in this outlet, highlights the sharp taste of soy sauce (醤油). Each bowl of ramen contains several slices of barbecued pork (チャーシュー). Made fresh in the kitchen, the pork slices are tender and juicy indeed. As for the onsen tamago (温泉玉子), tonkotsu essence penetrates the egg thoroughly. Other vital ingredients are bamboo shoots (メンマ), seaweed (のり) and scallions (ネギ). 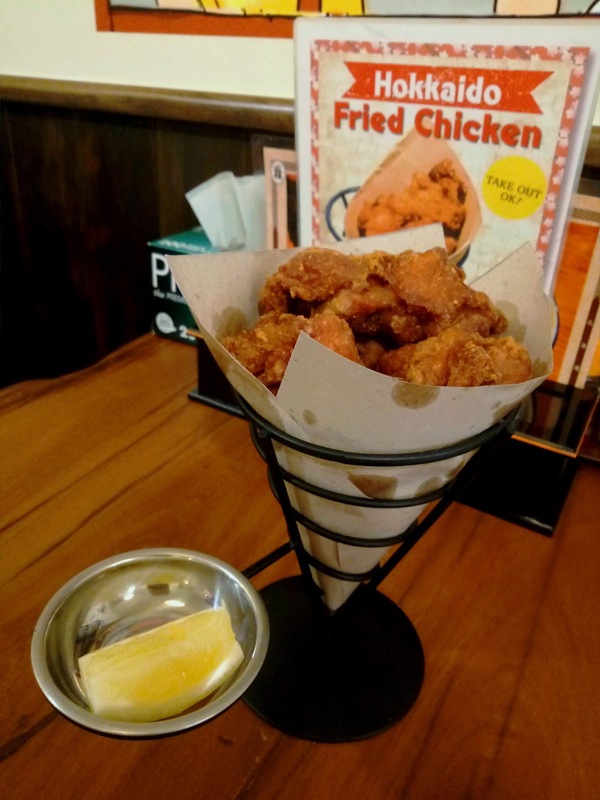 Menya Miyabi also offers Hokkaido Fried Chicken (北海道ザンギ) as a side dish. While most Japanese use the general term "karaage" (から揚げ), fried chicken is peculiarly called "zangi" (ザンギ) in Hokkaido. At Menya Miyabi, Hokkaido Fried Chicken is available in 1 (RM3.00) or 5 (RM15.00) pieces. It is suitable for take-away orders. What I love about the Hokkaido Fried Chicken is the fact that the marinade permeates the entire chicken. Even as the chicken cools down, it still remains fairly crispy. Nevertheless, it is still advisable to consume Hokkaido Fried Chicken while it is warm. A squeeze of lemon juice heightens the already-lovely taste. Operating a ramen shop is no easy feat. A significant amount of time goes into preparing the broth. 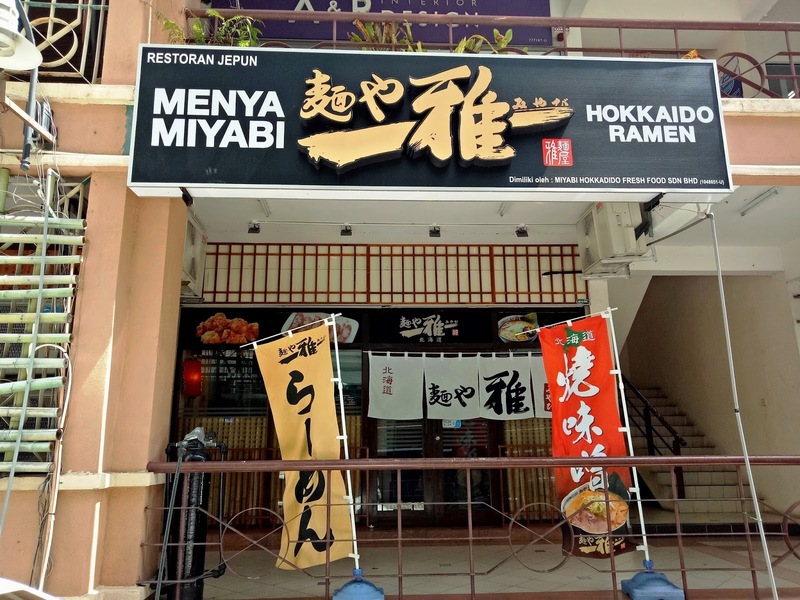 Unlike most ramen restaurants in Malaysia, Menya Miyabi remains faithful to the authentic recipe in Japan. It is no wonder the restaurant is very popular among Japanese families especially on weekends. 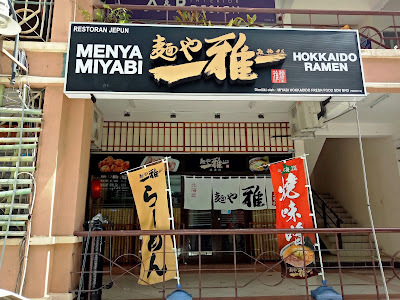 Directions: Menya Miyabi is located at Prima Tanjung, at the row that faces away from the main road. It is sandwiched between Aji Noren and K-Pot. Street parking is available around Prima Tanjung.